Ash absolutely loves chowing down on bibimbap and couldn’t wait for Chris to try it. Never mind that Chris originally thought she had made up the word! We finally found the perfect opportunity one evening while we were in the Yonge and Bloor area to stop in at Oja Korean & Japanese Cuisine. Oja is located centrally downtown on Yonge Street just South of Bloor. Oja is a modest sized restaurant with some cozy wooden booths and tables. It is dim and quiet, perfect for a low key meal. The space is clean and features tasteful , modern decorations. Staff are very welcoming and friendly , greeting us warmly as we come through the door. It seems to be a family owned and operated restaurant. Staff was very attentive,taking the time to explain the menu to us. Our server was over to take our order quickly and came to check on us and refill our beverages often. She even checked with the kitchen and offered to make up a chicken bibimbap in place of the traditional beef. So, what the heck is bibimbap? 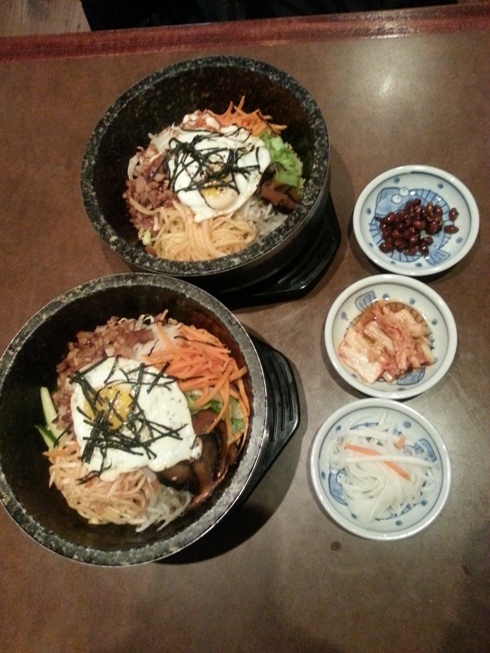 Bibimbap is a staple meal in Korean dining. the word itself literally means, “mixed rice. It is a bowl of white rice , topped with Korean sautéed and seasoned veggies, sliced beef, and chili pepper paste. It is topped with a raw or fried egg. All of the ingredients are to be mixed together right before eating. Dolsot bibimbap is served in a hot stone bowl, this is Ash’s favourite, as it makes the outside rice crispy and delicious. We knew bibimbap was a definite choice. So we ordered two, with chicken. Traditional Korean meals are served with banchan, or small side dishes. The banchan at Oja were kimchi, kongjaban ( black beans cooked in soy sauce and sugar), and pickled radish. Some restaurants serve as many as ten banchan with a Korean meal! The bibimbap was excellent. Ingredients were fresh and tasty and they combined to make a delicious flavour combo. The grilled cubed chicken was a welcome addition to the dish and the red chili paste was just spicy enough to add some zing without numbing our taste buds. 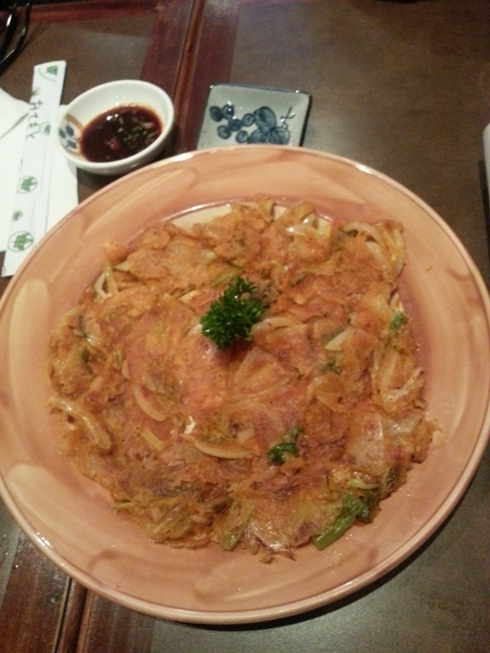 We also ordered a kimchi pancake. Chris had never tried kimchi before, so we thought we would keep the new experiences coming. This was a flat pancake loaded with kimchi (spicy fermented cabbage). It was a tasty combination of sour and salty. 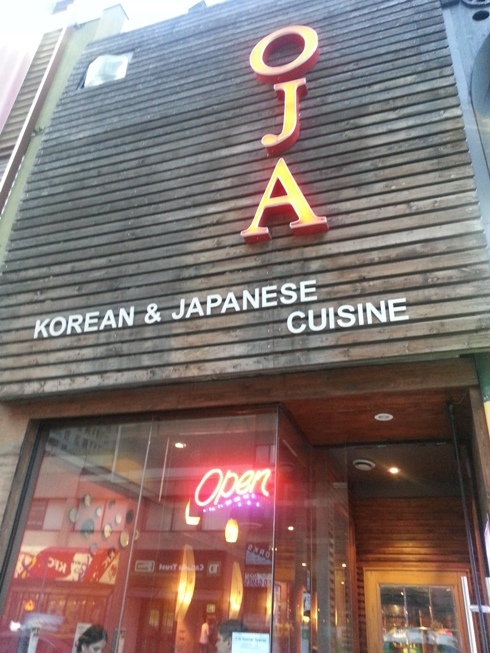 Last but not least, we decided to take advantage of the fact that Oja features both Korean and Japanese cuisine. It wouldn’t be a TNL restaurant review without a bit of sushi, would it? 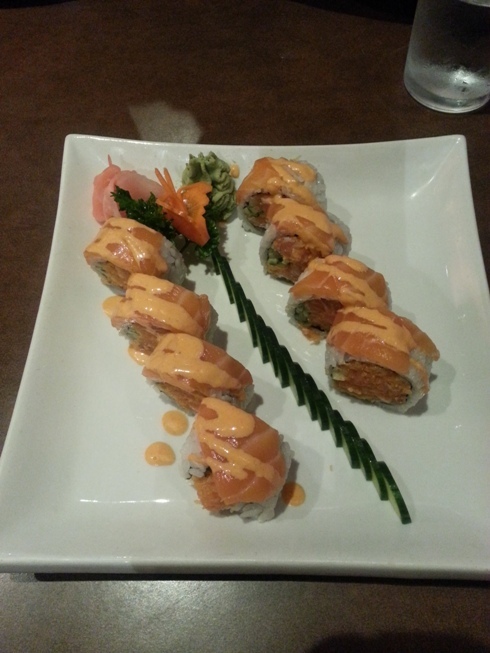 Oja’s red dragon rolls were delicious and stuffed to the max with fresh salmon. At about $10, you can’t beat bibimbap for a healthy, tasty well-rounded meal. The app and sushi roll that we threw in made a full meal for two about $40, not bad considering we really didn’t need the extras! As alll of the food was clearly made with fresh, high quality ingredients. For that reason, we think value at Oja is very good. We really enjoyed our meal at Oja. In addition, the kind and friendly staff made it a very positive experience. We will certainly be returning to Oja for delicious Korean and Japanese food at a great value. Have you ever eaten at Oja? I love, love love Oja! The kimchi pancake is so delicious, and I’m with Ash on the dolsot bibimbap – scrumptious! I always recommend that place to people who frequent downtown because the food is always amazing and the service is polite, friendly and fast. They are never in a rush for you to leave which is also nice…and it is a small detail, but I really love the Japanese pottery they serve their tea in.